Strange things always seem to happen around Tanya. Though it was easier to explain away when she was younger, now that she’s thirteen, it’s a different story. The truth is that she can see fairies. But that’s not all; they’re evil fairies. They torture her mercilessly if she tries to tell anyone else about them. Before long, her exhausted mother has had enough of her unexplainable behaviour and sends her to stay with her grandmother at Elvesden Manor. Tanya hates it there because of her grandmother’s frosty personality, but a growing friendship with the caretaker’s son, Fabian, the intriguing story of a strange girl and the unravelling of a fifty year old mystery pull her into a fantastical adventure. 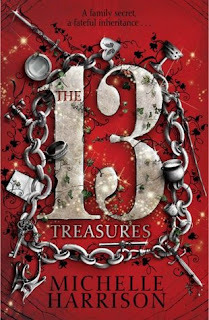 The Thirteen Treasures by Michelle Harrison is a great book. I really enjoyed it from beginning to end as it was full of surprises and interesting twists and turns. I wasn’t sure that I would enjoy this book as I haven’t enjoyed other books about fairies I’ve read (apart from Artemis Fowl, of course). However, Harrison’s fairies were brilliantly imagined and I can’t wait to read more of them. Harrison wonderfully wove plot threads together leading to a dramatic climax. I loved how all the storylines fit in the end like a jigsaw puzzle. I didn’t have any unanswered questions which is very satisfying. Tanya is a very relatable character. Of course, she is frustrated by her gift (or curse, depending on how you look at it) of having the second sight but ultimately, she wants to learn more about fairies and help others. I liked Fabian because he was always curious which meant that they found out a lot of things but undoubtedly got into danger. The other characters were very well written, though I do wish there had been more scenes with the fairies and Fabian’s grandfather, Amos. I felt that he was an important character as a lot of the story centred on him. While I could work out some of the characters, I remained suspicious of one or two characters’ motives until the end when all was at last revealed. I loved Harrison’s writing as I could visualise the manor, the village and the woods very clearly. The villain was horrible and very scary. Though I did figure out some of the plot before the end, there were some great twists still in store for me. I was biting my nails as Tanya at last met the villain. Overall, The Thirteen Treasures by Michelle Harrison was a great book and I look forward to reading more of the series. I love Michelle Harrison - she's an excellent writer.